We love transit geeks, especially ones who are handy with time-lapse videos. Via SFist, we found YouTube user STLTransit, who created time-lapse videos of public transit systems, including one of San Francisco that shows the movement of every Muni bus, BART train, and ferry boat over a period of 24 hours. I just can’t stop watching the littler dots of buses buzzing by, and the color-coordinated dots for BART lines whizzing through the East Bay. The San Francisco Police Department arrested a suspect in the vandalism of a Muni bus near Third and Market Streets Sunday night, photographed by a Chronicle reporter above. The picture was widely circulated online, which led to arrest of Gregory Tyler Graniss, 22, of San Francisco, reports The Chronicle. But the arrest came after some online weirdness that almost pointed the finger at the wrong person. But Facebook commenters “got the wrong guy” because of a misfired joke. According to a Wired.com story, a San Francisco man named Tony Lukezic used a photo of one of the vandals as his Facebook profile picture because friends say he looked like the vandal. He thought it would all be a funny joke. What isn’t too funny is that after he changed his Facebook profile picture, Facebook commenters threatened Lukezic, posting his phone number and threatening to turn him in to the cops. Now that the police has arrested Gregory Tyler Graniss (aka, not the Facebook joker), investigators are still looking for other vandals who set a Muni bus on fire. A Muni Diaries reader sent us a video of the bus being lit on fire Sunday evening. According to KTVU, nine people have been charged with crimes related to Sunday night’s vandalism, and 36 people have been arrested. Yesenia filmed this video last night of Giants revelers rioting on Muni and sent it to us via the Muni Diaries Facebook page. 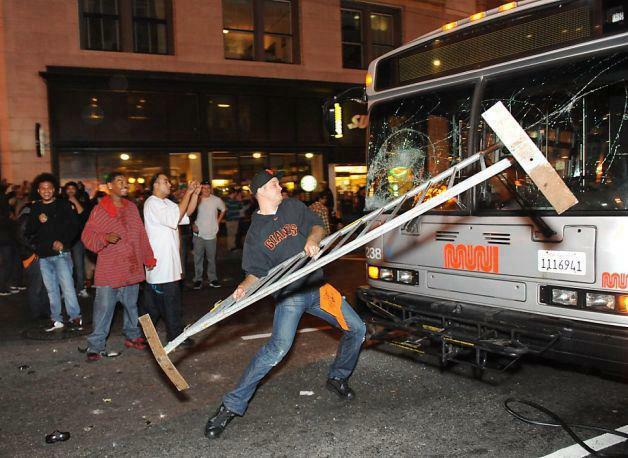 In the video, rioters started filming a bus rider who didn’t have as much Giants spirit as everyone else. Here’s Yesenia’s account of the evening. Here’s video I shot on my iPhone of rioting on Muni on McAllister and Larkin. I started filming toward the end, about ten minutes before the cops showed up. There were a few buses stalled there because the streets were overflowing with people. When rioting began on Muni, this particular gentleman on the back of the bus was having none of it. He sat there stonefaced amidst all the chaos, presumably texting to his friends about his miserable experience commuting on Muni yet again. Everyone outside noticed his lack of spirit and started taking pictures and video of him until the lights went out. Earlier: Photos of buses set on fire, trashed, and climbed on by rioters. Talk about a captive audience. Dunkin’ Donuts has launched a unique olfactory ad campaign on buses in South Korea, spritzing morning commuters with smell of coffee. The campaign uses air freshener-like devices that squirt the coffee aroma when activated by a jingle in Dunkin’ Donuts radio ads that play on the buses. The ads are timed to air right before you roll up to a bus stop with Dunkin’ Donut ads and a Dunkin’ Donut shop located conveniently across the street. The company says it has seen a 16 percent increase in visits to its stores. I guess the smell of coffee beats lots of other possible smells on the bus. What do you think of the ad campaign? Too creepy or kind of cool?